Metric: Icicles Given you're in a glacial city in a race against time with some rather toothy enemies, the artistic metaphor seems apposite. DISCLAIMER: Review based on PDF copy & Maptools elements provided by Rite Publishing. A Pathfinder module for 8th-level characters with Maptools support built in! Evocative setting, slam-bang action, eminently re-useable villains and magical items. The layout is a cut above many PDFs. The Maptools elements get their own documentation and are fun to use. Entering a besieged city on a rescue mission is one thing. A glacial city trapped by a cannibalistic legion of hellish warriors? That might be a little bit harder. This scenario takes full advantage of the cold environment to give the players food for thought. The siege provides entertaining encounter elements. Iconic arctic encounters have twists, NPCs have their own ideas. A party will need both tactical and social skills to get out alive with their rescuee. Chances for reckless heroism and cunning strategy abound. Risks carry reward - some tactics are preferred of course. The stakes escalate as the city falls apart, it's secrets revealed and the Hungering Legion gets ever closer. This adventure draws on deep roots. Elements of Band of Brothers, Kull the Conqueror, and A4: In The Dungeons Of The Slave Lords combine beautifully. The sense of high adventure and dark fantasy about Forstor Nagar makes this scenario sing. The scenario is flexible enough to provide multiple routes to the key encounters. It provides a raft of motivations to visit and following actions once the adventure is done though there's enough here to set up a campaign arc. The MapTools elements mesh well and are well-crafted. There's documentation and if that's not enough, video tutorials at Rite Publishing. Those familiar with technology like MapTools and Google+ will find this useful. The tokens can be adapted to cardstock if Internet access isn't essential at your table. Art/Layout: 5 icicles (coldly beautiful, has style and substance). Tyler Bartley's cover is ominous yet gives away nothing. Interior art by Bartley, Jonathan Roberts and James Hazlett convey the epic nature of the setting. The cold colours help evoke the feel of the scenario. Layout is simple yet effective, text boxes are uncluttered and the page backgrounds are lovely. Stat blocks are clear, concise and informative. Visually-appealing encounter maps help speed setup and shading highlights information to the busy GM. In conclusion, this is a blast of a scenario - Ben McFarland has created a rollercoaster ride, the art and layout make it pretty damned excellent. Nods to Open Design's Midgard setting with pre-generated PCs show how well this scenario integrates with other settings. 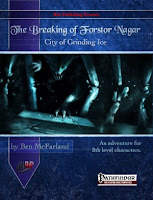 With Forstor Nagar, Rite Publishing have provided an excellent introduction to open mapping support for scenarios - hopefully the first of many. Sounds like an interesting scenario. The Hungering Legion is a cool name. They are a very cool villain concept/template and take the idea of 'eat what you kill' to a logical conclusion (think wendigo/atshen legends). Other items in here are eminently borrowable for other projects. I could imagine a version of Forstor Nagar in Weird Adventures.